Want to write and publish a children’s novel? Join me, author teacher Karen Tyrrell as I share my secrets in creating and publishing a successful children’s novel. I’ll share tips on crafting unforgettable characters and a story line hooking in the reader. 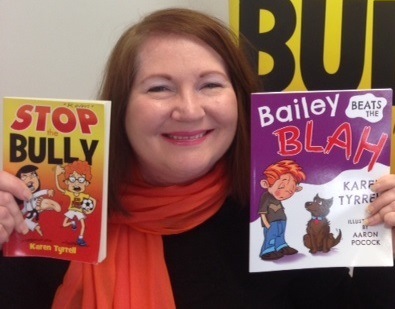 PLUS I’ll reveal my secrets on how I wrote and published bully prevention junior novel STOP the Bully and resilience picture book Bailey Beats the Blah with 5 STAR reviews from teachers, school counselors, reviewers and mental health CEOs on Amazon and Goodreads. His life is falling apart. Dad abandoned the family. Brian hates his new school. And now an aggressive bully attacks him every day. At the workshop, I’ll divulge my writing tips gained from over twenty years’ teaching experience with schools, libraries and Gifted & Talented Classes. Cupcakes by Charmaine Daly @ Lets Create Cakes … Coffee and Tea provided.